Should You Give Your Dog a Probiotic Supplement? Probiotics are something that you may take for yourself to better improve your health and wellness. 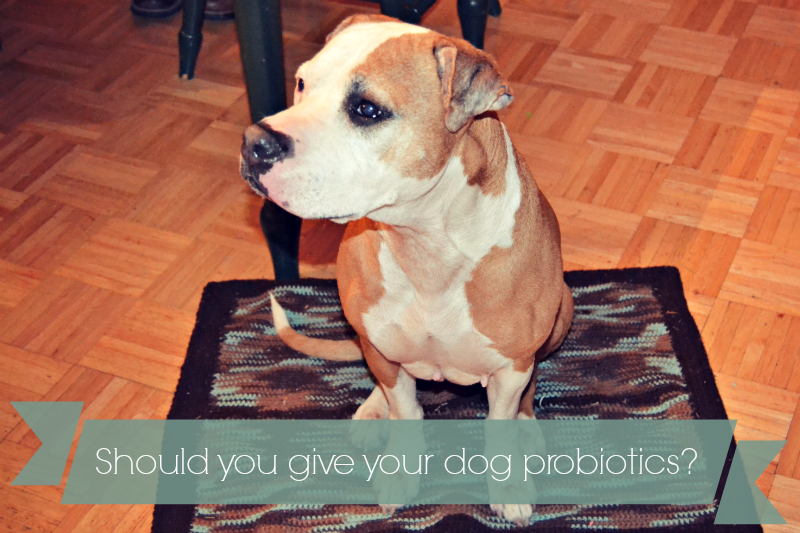 But have you ever considered giving your dog probiotics? I know there are many dog parents out there who like to feed their furry friends a little bit of yogurt every now and then, which is fine if it agrees with your pup's tummy. If you are giving the yogurt to your dog because of the good bacteria it has, you may want to rethink your approach. Yogurt that people eat is designed with humans in mind, and not dogs. The good bacteria strains included in it may not necessarily benefit your dog's digestion. But, there are probiotic supplements available made just for dogs. 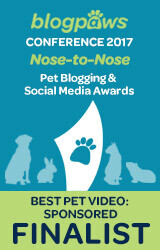 We were recently asked to test out 5 in 1 Probiotics for Dogs from BioNatural Pet. I have been giving this supplement to Shiner for a month now. The formula contains five effective strains of probiotic bacteria and is an all natural way to help your dog get the most benefit from their meals. My parents sometimes complain that Shiner "stinks". It can be pretty disheartening and a little annoying to hear all the time. To me, she just smells like a dog, and that's fine. 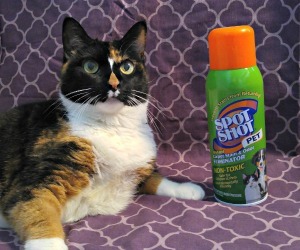 Since Shiner has been taking this supplement, I don't think I have heard anyone call her stinky. I am used to her smell, so it's hard for me to notice if it's changed much. Since we've been using the 5 in 1 Probiotics for Dogs, she hasn't had any yeast-related infections either and her ears seem clear. What about Shiner's gas? Well, I have heard her toot here and there still. But, none of her toots have been overly stinky. She used to be able to clear a room sometimes... I think her gas has also decreased since she's been taking these probiotics. Shiner has never really had an issue with gastrointestinal upset, thankfully. She does, on occasion, have some diarrhea every few months. She hasn't had any episodes in the past month. I know there are many dogs who have sensitive stomachs and have loose stool on a more regular basis. I think this product is nice to have on hand for more sensitive pups and think they could benefit from it. This product comes in a powder form. 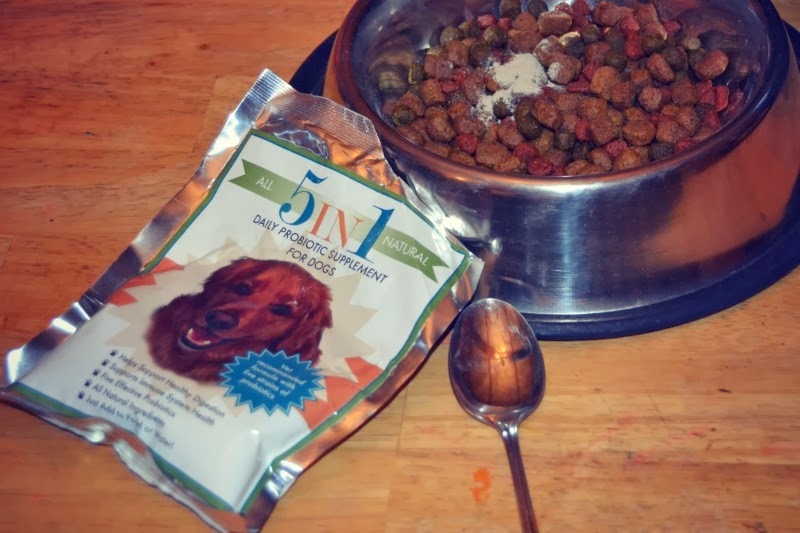 The directions say to give one teaspoon of the powder in your dog's food once a day. I have been sprinkling it on Shiner's dry food and adding a little water with it to moisten it. Shiner loves it and thinks she is getting an extra special meal. The only downside on giving her the powder for me is that the bag is not resealable. Fortunately, it is easy to fold over and clip shut. Otherwise, it's pretty simple to administer! 5 in 1 Probiotics for Dogs from BioNatural Pet is available for purchase on Amazon here. Or, if you live in Michigan you can find it at a few retailers. Visit their website here to see more about the product and a list of retailers. This post is sponsored. I am being compensated for my time on this review and helping spread the word about 5 in 1 Probiotics for Dogs from BioNatural Pet, but Pawsitively Pets only shares information we feel is relevant to our readers and all opinions expressed here are the truth! We never thought about yoghurt or probiotics before. Interesting to read it helps with yeast infections in the ears. Have a marvellous Monday. I think it's pretty cool and it definitely makes sense. As women sometimes eat yogurt when they take antibiotics because they may be more prone to yeast infections at that time. It works the same for dogs! Lol, well Shiner isn't stinky to me! My parents are not always so dog friendly or savvy. But it's annoying to hear it all the time. Maybe I am just used to her scent. That sounds like a great idea. Our dog doesn't have digestion problems yet but she also stinks so if they help that problem, we are all for it. Thanks for this great review. I think it isn't bad for them, but those kinds of things are made for humans. A human gut is not the same as a dog's and beneficial bacteria probably differs between the two of us. Very interesting post! I didn't know that about yogurt! Great post, Miss Ann! I get yogurt every once in a while but we didn't realize that it really only helps people and not dogs. I used to take a probiotic supplement; haven't for a while but after readding this I think it would be a good thing to go back to. It couldn't hurt any Oz :) We used to prescribe probiotics to dogs and cats who were having tummy troubles when I worked at the vet's office. 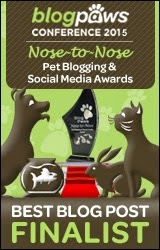 Scout has started having the most terrible gas:( I might need to check this out! Trust me - I have been there! Shiner's gas was super stinky!! While she still is farting on occasion, I haven't smelled anything foul since she's been taking this. I sure wish they would make products with pill or powder form as powder is such a hassle for us. We don't have many of those issues it is supposed to help with...well, we do occasionally have wet dog smell, but other than that we seem to be doing fine. We all help clean out the yogurt container in the morning, but that is just because we love yogurt. Yogurt IS pretty tasty Emma! And you are right, I have never seen a probiotic in a pill or chewable form before. Interesting. We started giving Thunder a probiotic after he bloated to help his digestion (rather than put him on medication which is sometimes required). We tried various canine probiotics which did not work, but yogurt worked well for him. If we find the yogurt stops working I will keep this product in mind. Thanks for the review. That is awesome that yogurt is working for him! What a great approach to resolving his issues in a more natural way. We have seen some good science that supports the probiotics and we have thought about them for us kitties too. We did used to prescribe probiotics to kitties too who were having tummy troubles. They can also be a good thing for cats! Yummy :) glad that probiotics were able to help her. If you are referring to Sugar's comment, I think she just means that she ate plain yogurt as a probiotic. Good to know, we had never used them with our dogs before so interesting to consider! Interesting! We never thought of probiotics for our pets. We aren't big on supplements here for people either, but we can see they might help. We're all over the concept! Of course we don't GET them yet. But that's cuz our mommy's such a slacker. I think probiotics are great!